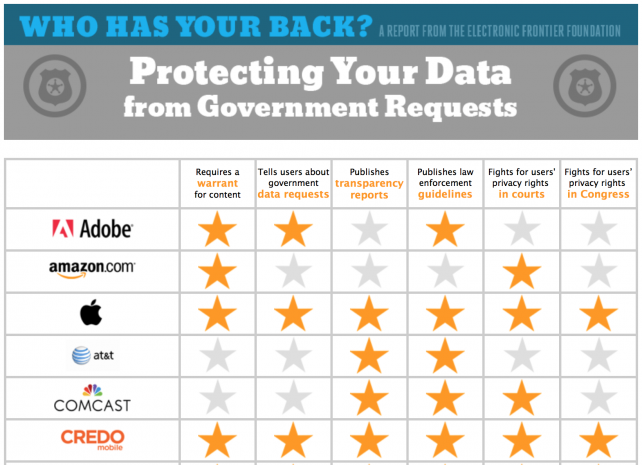 The Electronic Frontier Foundation (EFF) fifth annual “Who Has Your Back?” report suggests companies such as Apple, Yahoo, Dropbox, and Adobe are doing the best job in keeping their users data secure. Whereas Whatsapp and AT&T sits on the bottom of the ranking. The survey evaluates companies users privacy protection management, and their practices when responding to government request for users data. EFF who focuses on users digital rights, has several criteria to assess company practices & policies, such as following the Industry’s “best practices”, informing users about data government demands, publicly disclose the company’s data retention policies, disclose the number of times governments seek the removal of user content or accounts, and oppose government “backdoor” policy in digital services. The report awards star rating up to five stars, based on whether the evaluated companies meet the said criteria. The “following industry-accepted best practices” is a combined category in regards to corporate transparency. To meet this criteria and be awarded a star, companies must urge the government to obtain a warrant from a judge before handing over the content of user communications, publish transparency report, and publish law enforcement guides explaining how they respond to data demands from the government. As cited by Times of India, after Edward Snowden’s revelations on government mass surveillance, a number of major technology companies including Facebook, Google, Apple and Microsoft urged US President Barack Obama to reject any policy that will weaken encryption technologies, thus endangering consumer’s privacy. While this debate on encryption is still an issue, EFF made a special criteria that asks tech companies to oppose deliberate security weaknesses, and compelled backdoor. To be awarded a star on this category, companies must show their stance in a blog post, in a transparency report, by publicly signing a coalition letter, or though another public, official, written format.